17-year-old Mitu is married, and thankful she is not a mother. Along with one-third of Bangladeshi girls, Mitu got married before the age of 15. She was only 12 when she moved to Dhaka with her parents, who were in search of a better livelihood. She soon started work at a garments factory, and a short while later, fell in love with a colleague. At just 13, she was married. Unlike many other adolescent married couples in Bangladesh, Mitu and her husband knew they were not ready to be parents. 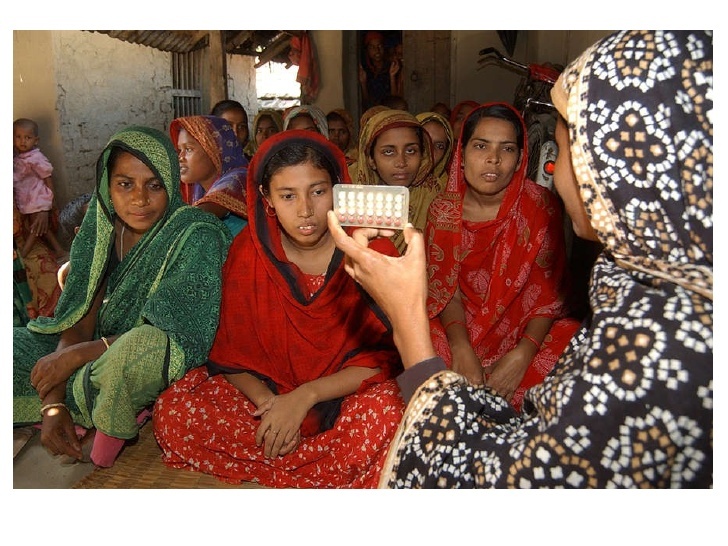 And unlike 53% of adolescents who don’t have access to contraception, Mitu did, through BRAC. “I’ve been on the pill for four years, and my husband and I have agreed I’ll continue taking it for another year until I’m 18”, she explains. After that, they’ll decide if they want to have a baby. Fifty years ago, in 1968, a bold global resolution was passed, proclaiming family planning to be a human right. This declaration recognised that women require access to information and services to be able to “decide freely and responsibly the number and spacing of their children”. Since its inception in 1972, BRAC has regarded family planning as central to gender equality and women’s empowerment, and as a key factor in reducing poverty. In 1974, community health workers (CHWs) started a door-to-door service in Bangladesh, delivering contraceptives to women who traditionally do not venture out of their homes. 20 years later, in 1994, BRAC worked alongside the national structure to introduce a family planning facilitation programme in four districts. Since then we have scaled up, and now provide family planning services in 61 districts, six of which are in remote, hard-to-reach areas. In Bangladesh, where under-age marriage is rife, access to family planning is particularly linked to adolescent girls’ sexual and reproductive health rights. It is estimated that 66% of girls marry before they turn 18, and one-third before they turn 15. According to the national data sources, less than half (47%) of adolescent married girls have access to contraception. There are a number of contributing factors, notably a lack of knowledge, illiteracy, shyness, fear, religious sentiment, and low inter-spousal communication on family planning. Married adolescent girls are unlikely to have decision-making powers as many are uneducated and disempowered. The use of condoms is low amongst men in Bangladesh, thus increasing the chances of adolescent girls having untimed and unwanted pregnancies. This cohort is a key focus of our family planning programme. Our community health workers strive to reach this underserved population, who are most at risk of pregnancy and birth complications, due to the stress placed on their developing bodies. On a daily basis, across the country, community health workers provide family planning services to women, adolescent girls and men. The shasthya shebikas (community health workers) sell pills and condoms, while the shasthya kormis (community health volunteers) assess the need for contraception, provide counselling, and advise couples on suitable options. 18-year-old Rima is grateful she could turn to a shasthya kormi when she required assistance. At 16, Rima got married without informing her parents. Her husband, an older businessman, felt she shouldn not fall pregnant immediately. Rima agreed. She had previously attended BRAC’s adolescent youth forums, and was aware of the complications of early pregnancy. But when it came to choosing a contraceptive method, the newly married couple was confused. “I contacted the shasthya kormi in my area, and asked her what to do. She advised me to start on the pill”, says Rima. For the past two years, she has consistently taken the pill, obtaining her monthly supply from her local shasthya shebika. “Taking the contraceptive pill from the beginning of my marriage was a very good decision we made”, she smiles. In addition to home visits, shasthya kormis organise weekly forums for adolescent girls, pregnant and married women. 43,000 health forums are held every month on average, reaching 645,000 people, largely attended by women, who are available during the day. However, women are rarely the decision-makers, making it imperative to reach men too. Weekly evening sessions are held for them, where a range of health topics, from diabetes to family planning, are addressed. On an informal basis, male programme organisers speak to farmers in their paddies, and raise the subject at tea stalls. These intimate community interactions are crucial to informing mindsets, and influencing behavioural change. At an institutional level, BRAC has 45 centres, staffed with fully trained doctors, midwives and nurses, that provide extensive family planning services-provision of pills and condoms, menstrual regulation, insertion of implants, IUD’s, vasectomies and sterilisation. The government’s FP 2020 mandate demands a specific focus on improving utilisation of long term reversible and permanent methods particularly IUDs, implants, vasectomies and tubectomies. Our community health workers engage in promotional targeting, advising couples on the best option for them, taking into account age and the number of children they have.